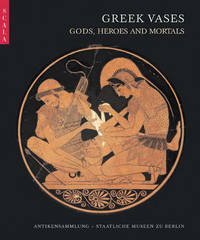 Greek vases are a vital source of information on mythology and society in ancient Greece. These painted clay vessels played a variety of roles in daily life and religious ritual, and the pictures and patterns on them provide a key to understanding these roles. The Antikensammlung (Collection of Classical Antiquities) in Berlin stretches back more than 300 years, and vase paintings illustrating well-known myths and sagas have long been a key field of interest. Today, the Berlin collection ranks alongside those of the British Museum, the Louvre, the Hermitage and the Metropolitan Museum as one of the largest and most diverse of its kind. Co-published with Ernst Wasmuth Verlag, this lavishly illustrated new book is the first to focus exclusively on the Antikensammlung's Greek vases. The authors, who are distinguished specialists on the collection, have selected 62 of its finest works and provided an expert commentary.